The holiday season is a time of joy, laughter, and love. No matter which holiday you and your loved ones celebrate this year, remember that fire safety always comes first. Putting up a Christmas tree, decorating the house, or baking holiday treats are all common activities that can lead to unwanted household fires. Read on for the fire safety tips every homeowner should know. When shopping for a real tree, choose one with fresh, healthy needles. One way to be sure you have selected a healthy tree is to check if the needles fall off easily. If they do, the tree is likely already drying out and poses a greater fire safety risk than a healthier tree. Before placing your real tree on the tree stand, cut two inches off the base. Be sure to position the tree at least three feet away from the fireplace, radiator, candles, lamps, and other heat sources. Water the tree every day to keep it from drying out. When real trees become excessively dry, they are more likely to catch fire. If you haven’t already, switch to LED bulbs for your Christmas tree lighting. They do not emit heat. Heat-emitting lights can be a fire safety risk. Plus, LED lights will last longer, too. Always make sure the smoke detectors in your home are working well and have new batteries in them. Consider installing fire protection sprinklers or other services to safeguard against accidental fires. Dispose of your conifer tree immediately after the holidays. Do not leave it in your garage or basement for an extended period of time. Most areas offer curbside pickup. Or you can look for a tree recycling center in your area. All decorations should be flame-resistant. Whenever possible, opt for LED lighting instead. Keep all decorations at least 12 inches away from the fireplace, open candle flames, and other heat sources. Do not use electrical decorations that have damage. This includes light strands, inflatable decorations, and anything else that lights up. Use clips instead of nails, to secure light strands in place. This will help prevent damaging the cord. Replace all damaged or very old decorations with new ones. Always look for LED options. Ensure all of your smoke detectors are working. Consider using timers to automatically shut lights on and off. This can help prevent electrical fires when you are not home. About 300 holiday decoration fires, or 36 percent of the total amount reported, are started by burning candles. While candles can have a very soothing and relaxing feel, it is important to keep these fire safety tips in mind throughout the holiday season and the rest of the year. Keep matches and lighters out of the reach of children, preferably in a locked cupboard. Keep burning candles away from both children and pets, as well. Remember to blow out your candles if you leave the room or go to sleep. If a ceremonial candle must burn continuously, place it in an enclosed glass container and set it in the sink, or a metal tray, or in a deep water-filled basin. Never leave a burning candle unattended on a table or countertop. Christmas trees and candles do not mix. Under no circumstances should you leave a burning candle within range of your highly flammable tree. Consider switching to flameless candles to prevent fires. This is especially important if you are planning to have many visitors over or have small children and pets around. When baking with children, never allow them to put things in or remove things from the oven alone. Always use a timer when baking. The holidays can be a busy time and it is easy to forget about one task as you begin another. 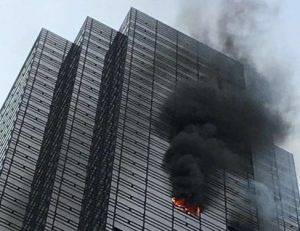 A timer can help prevent fires. Do not use very old or damaged appliances or electrical tools in the kitchen. Before you begin your holiday prep, ensure all fire safety services around your home are fully functional. Though holiday fires are not exceptionally common, they can be devastating. Always be sure to have proper fire safety regulations in place to protect you and your loved ones this holiday season and the rest of the year, as well. 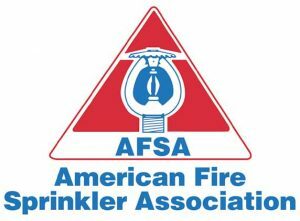 The American Fire Sprinkler Association (AFSA) Fire Sprinkler Fitter National Honor Societyn was established in 2012 to recognize trainees, and their sponsoring employers, who have completed all four levels of the AFSA Correspondence Course for Fire Sprinkler Fitters with a cumulative grade point average of 95% or above. 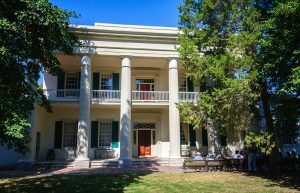 Inductees into the 2017 class represent approximately the top nine percent of the 172 four-level graduates for the year. Recognition plaques were provided to the sponsoring employers so that they can present the plaque to their fire sprinkler fitter graduate. 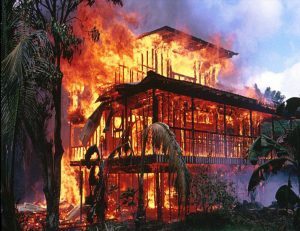 On average, 7 people, mainly children and the elderly, die every day from a home fire; 36people suffer injuries as a result of home fires every day, and over $7 billion in property damages occur each year. The Red Cross launched their Home Fire Campaign (http://www.redcross.org/get-help/how-to-prepare-for-emergencies/types-of-emergencies/fire/prevent-home-fire) in 2014 in an effort to reduce fire-related deaths and injuries in the US by 25%. Since the campaign launched in 2014, the Home Fire Campaign has helped install over one million smoke alarms, in over 500,000 homes, saving over 400 lives. A critical part of this campaign is Sound the Alarm (https://www.redcross.org/sound-the-alarm), which is a series of home fire safety and smoke alarm installation events across the country. This spring, from April 28th to May 13th, the Red Cross will be installing 100,000 free smoke alarms in over 100 cities across the country as part of this campaign. 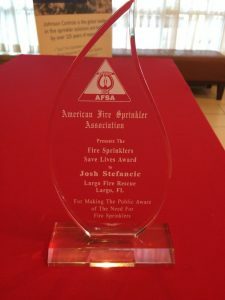 The American Fire Sprinkler Association (AFSA) joined forces with the Red Cross to support this campaign, with the goal of raising $10,000 to integrate fire sprinklers into their Home Fire Preparedness Campaign. The AFSA is currently a quarter of the way to their goal and needs more help. Your tax-deductible donation will not only enable the Red Cross to provide critical support to those struck by home fires, but will also help get fire sprinklers included in the educational information shared by the Red Cross. Get involved with the Red Cross Home Fire Campaign to help save lives across the country. Teach home fire safety. Did you know that if a fire starts in your home, you may have as little as two minutes to escape? During a fire, early warning from a working smoke alarm and a regularly-practiced fire escape plan can save lives. 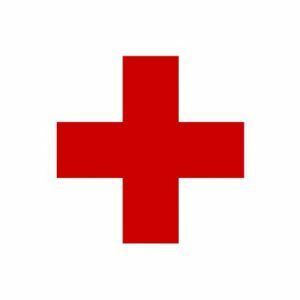 Become a volunteer with the Red Cross (http://www.redcross.org/volunteer/become-a-volunteer). Whether helping displaced families, providing care and comfort to the ill or injured, or teaching others how to respond in emergencies such as home fires, it’s important that we all do our part. Join the Sound the Alarm campaign. Get involved in events near you by working in teams to install free smoke alarms across the country and spread fire prevention and safety education. Hydrant flow tests are important to determine the flow rate and pressure in any location throughout a water distribution system. 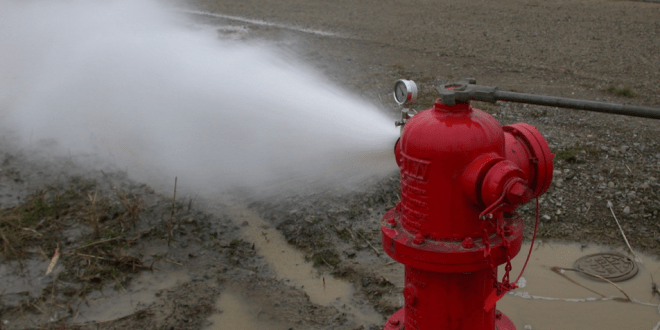 To ensure that fire hydrants are capable of providing water at an acceptable pressure and flow rate for public health and firefighting operations, hydrants must be tested regularly. Hydrant flow tests are conducted to provide information to design a water-based suppression system and to determine if the water supply will meet firefighting requirements. To minimize time and monetary cost, it is important to ensure that flow tests are conducted properly to reduce the chances of having to conduct multiple tests. 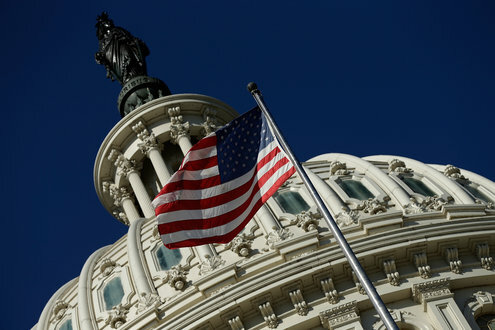 For example, if tests conducted incorrectly may determine that a fire pump is not necessary when it actually is, and end up wasting time and money while harming reputations. To avoid this, it is best to complete hydrant flow tests as correctly as possible. Fire hydrant flow tests can vary greatly across the industry and the nation. To ensure that flow tests are correctly performed, we recommend following the recommended practice detailed by the The National Fire Protection Association (NFPA) in NFPA 291, Recommended Practice for Fire Flow Testing and Marking of Hydrants. Current editions of NFPA 291 recommend group testing, where you flow more than one hydrant. Although this may be problematic and not entirely necessary, using one hydrant for static and residual pressures while using a different hydrant for flow is the best practice. Chapter 4 of NFPA 291, 2016 edition, recommends having a static, or test, hydrant and one or more residual, or flow, hydrants. To determine how many flow hydrants are required, it is recommended to flow enough water to provide at least a 25% drop in residual pressure when compared to the static pressure. It is generally accepted that a 25% drop is not required to design a fire suppression system. Since the hydrant flow tests are also used to determine whether the water supply meets firefighting requirements, it is best practice to flow a similar amount of water as the most demanding flow, regardless of pressure. It is impractical in some jurisdictions to get a 25% drop in pressure, even when required fire flows are easily achievable. Ultimately, the results of the flow test should provide enough information to accurately plot the static and residual points on a water supply graph to demonstrate water demand against water supply. It may be best to show the water supply curve at 20 psi because the International Fire Code Appendix B and the NFPA 1 have required fire flows at 20 psi. When choosing which hydrants to test, it is important to consider traffic issues and any potential damage to the area surrounding the flow hydrant due to the water flow. After determining which hydrants will be used for the flow test, a time should be selected when there is “ordinary” water demand. For residential areas, this time might be between 6:00-9:00am and 4:00-8:00pm, when most people are at home using water. For industrial areas, this time might be between 7:00am and 6:00pm, as this is when most facilities will be operating. It is better to use 2 ½ inch hydrant outlets as opposed to the pumper outlets, which is anything larger than the 2 ½ outlet, because the 2 ½ inch outlets are completely filled across the entire cross section of the outlet. On the other hand, pumper outlets will have voids, which can result in inaccurate pressure readings. If using the 2 ½ inch outlets is impractical or if they cannot produce the necessary flow, the pumper outlets can be used, but the resulting flow should be modified to account for the voids in the water flow. When conducting the test, it is important to completely open all hydrants to reduce the potential for damage to the hydrant and preserve the accuracy of the test. For the greatest accuracy when conducting a reading using a handheld pitot tube, NFPA 291 recommends keeping the pitot tube pressure readings between 10 and 30 psi at full flow, or when the hydrant is completely open. This is due to the problems that arise when pressure is outside of that range. If pressures are below 10 psi, the flow is not enough to completely fill the cross section of the open outlet and can result in inaccurate readings. If the pressure rises above 30 psi, it can be difficult to align and maintain the position of the pitot tube for long enough to take an accurate reading. Furthermore, pressures above 30 psi may bend or break pitot tube blades. That being said, the 10 to 30 psi range is a recommendation. If it is impractical to open multiple hydrants at once, it is best to keep pressures as close to 30 psi as possible while opening as many hydrants at full flow as feasible. When using a handheld pitot tube, make sure to hold the blade perpendicular (at a right angle, or 90 degrees) to the outlet, so that the orifice of the pitot tube blade is approximately half the distance downstream of the outlet (1 ¼ inches for a 2 ½ inch outlet) and in the center of the flow for the most accurate reading. If multiple outlets and hydrants are used to achieve the desired flow, a single pitot reading at each hydrant can be taken and these values added together to determine the total flow at the residual pressure. As there are multiple products on the market that make finding flow pressure easier and more accurate, handheld pitot tubes are used less often. If you are utilizing one of these products, make sure to verify the flows at different pressure readings, as manufacturers may have different methods of determining the flow for products that are not covered in NFPA 291. These other products also have recommended pressure-operating ranges, so it is important to check all information before conducting a flow test. The NFPA 291 does have an option for getting flow reading without a pitot tube or other flow pressure reading device in Section 4.9. This section states that a hydrant cap can be used on one 2 ½ inch outlet while opening and flowing the other 2 ½ inch outlet, because the reading should be approximately the same. However, this should not be considered an equivalent option in place of a pitot tube and is only to be done if a pitot tube or other flow pressure reading device is unavailable. When conducting a hydrant flow test, it is best to have a selection of gauges with various pressure reading ranges, as gauges tend to be more accurate in the middle of their calibrated range. Furthermore, the range should match the flow that is being measured, as a gauge with a maximum pressure of 200 psi may have difficulty accurately reflecting a pressure between 10 and 30 psi. Conversely, a gauge with a range between 10 and 30 psi would not be able to measure a pressure that was much higher than 30 psi. Gauge accuracy is also a percentage of the maximum reading of the gauge, so a greater range is not always better. If there is a selection of gauges to choose from, then they can be changed to keep the reading within the optimal range. Although air-filled pressure gauges are usable, it is recommended to use digital or liquid-filled analog gauges, which can reduce the vibrations in the needle and make the reading easier to read. To obtain the most accurate reading from residual and flow gauges, it is best to let the hydrant flow for a little while to stabilize the flow before taking a reading. Once the flow is stable, note the high and low readings of the pressure range on the gauges to determine an average. The average residual and flow pressures are the values that should be used as results, as opposed to using the minimum or maximum value obtained. It is important to properly open and close hydrants before and after conducting flow tests. It is particularly important when conducting a flow test with a dry barrel hydrant or in areas subject to freezing. If a dry barrel hydrant is not completely opened, it can flow an excessive amount of water out of the weep hole and cause soil erosion around the hydrant base. Erosion over time can cause the hydrant to sink and may potentially damage the underground piping. Furthermore, if a dry hydrant is not properly closed, water can be trapped in the barrel or cause water to continually flow from the weep hole. Water trapped within the dry barrel in areas subject to freezing can cause internal damage to the hydrant. To ensure that hydrants are properly opened and closed, follow these procedures when opening and closing the hydrant. When opening the hydrant, count the number of complete turns to verify that are made until the operating nut can no longer turn, then turn it back a quarter of a turn. When closing the hydrant, count the number of complete turns to verify that it was the same number of turns as used to open the hydrant. Once again, the hydrant should be backed off a quarter of a turn. Before reinstalling the final hydrant cap, verify that the water has been completely drained out of the dry barrel by feeling for negative pressure at the outlet. To do so, place a hand over the open 2 ½ inch hydrant outlet for a few seconds to feel for suction. The first few times, there will be an audible pressure release when the hand is removed. Continue to do this until there is no more suction. Then, the caps may be safely replaced. Some other factors to take into account that can greatly affect your test results are whether there are any booster pumps on the water supply, whether there are water storage tanks, and the elevation of the hydrants. These effects have a higher residual pressure than static pressure, but not all water supplies have a linear relationship of flow to pressure. These measures are important because for some water supplies, when the flow demand increases, additional water can be provided to an area through multiple pumps or valves, causing complex geometries to the pressure and flow relationship at any given point in the system. Although there is no current guidance in the NFPA 291 about this effect, it may eventually be added. Note: Because NFPA 291 is a recommended practice, all recommendations do not have to be met exactly unless the local jurisdiction has specifically adopted NFPA 291. First responders report that fires recently are burning hotter and faster, likely due to the increase in synthetic furniture and home decor. Synthetic furniture and decor have been popular because they are cheaper than natural ones. However, most synthetics are made of petroleum (like gasoline), which could result in your house going up in flames in minutes. When synthetics burn, the chemicals released can replace oxygen in the body within two to three minutes of exposure, choking out anyone nearby. An experiment tested the burn time of two rooms, one furnished with synthetic furniture and the other with natural materials, and demonstrated the difference between synthetic and natural materials. The room with synthetic furnishings was full of flames and smoke within minutes. Flashover, or floor-to-ceiling flames, occurred as quickly as three minutes and forty seconds. On the other hand, the room with natural furnishings took almost half an hour before flashover. The company that conducted the experiment concluded that modern home fires burn eight times faster. As a result, firefighters are under more pressure and in more danger than ever before, not only from the greater intensity of the flames but also from the chemicals released when synthetics are burned. In fact, cancer has recently overtaken heart disease as the leading cause of death of firefighters. The exposure to these chemicals affects not only firefighters but homeowners and others in the building when the synthetics are burned. Avoid open concept homes and close doors when possible. 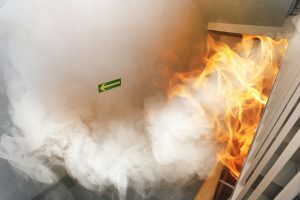 In the case of a fire, a closed door between you and the fire can keep temperatures down and provide more than double the oxygen to breathe compared to if the door was open. Make sure your fire protection systems are up-to-date and fully functional. For inspections, maintenance and repairs of your fire protection systems, contact CJ Suppression at (951) 735-5560 for a free quote. Create an escape plan for your home and ensure that all members of your family are well-versed in what to do in the case of an emergency.